Elite: Dangerous. I would hate to be “that guy” that historically brings up No Man’s Sky on this site, but I would be remiss if I didn’t tie in its relationship here. My now-obsession with Elite: Dangerous is mostly in part to an insatiable appetite for a better space exploration game for players. In what follows, you will see how I consider this merely a half-assed review of a game that puts you in the outskirts of a fully explorable 1:1 scale of our Milky Way galaxy, all while being a massive MMO. Lets get started! Not unlike most players, you might barely be learning about Elite: Dangerous just now after the wake of Hello Games’ aforementioned little indy game, NMS. Again, this is not bashing No Man’s Sky, this is how I choose to explain my deeply endearing love for Elite: Dangerous. For background’s sake: Elite: Dangerous is the fourth Elite game in a series that spans all the way back to 1984. Frontier Developments, who was known for a few unremarkable games considered Elite: Dangerous a Skunk-works of sorts. 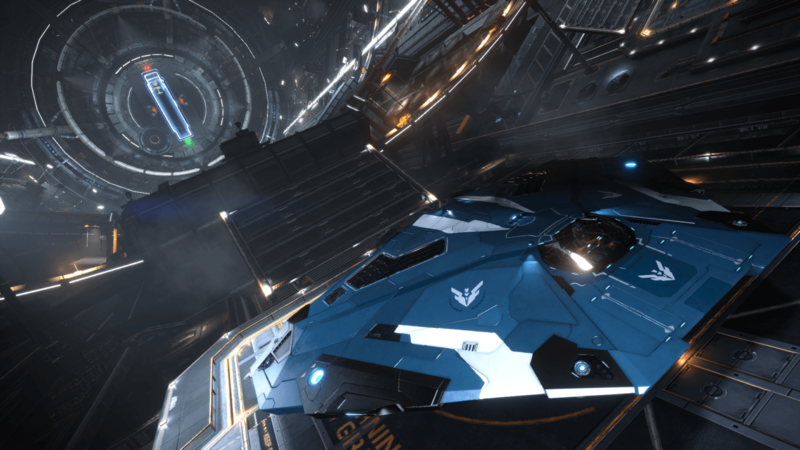 After being backed by a Kickstarter campaign, Elite: Dangerous is released on PC late 2014. Fast forward to late 2015 and Frontier releases Elite: Dangerous on consoles. I know this because I bought it shortly thereafter on sale and sat on this gem for almost a year before realizing it’s potential. Before I drop the NMS rhetoric, let’s compare really quickly Elite: Dangerous and No Man’s Sky. As the internet knows by now; No Man’s Sky is a colorful space exploration game where you can discover and name 18 quintillion procedurally-generated planets and each planet’s unique animals, harvest necessary minerals to create ship parts, fuel, etc to continue your journey to the next planet. 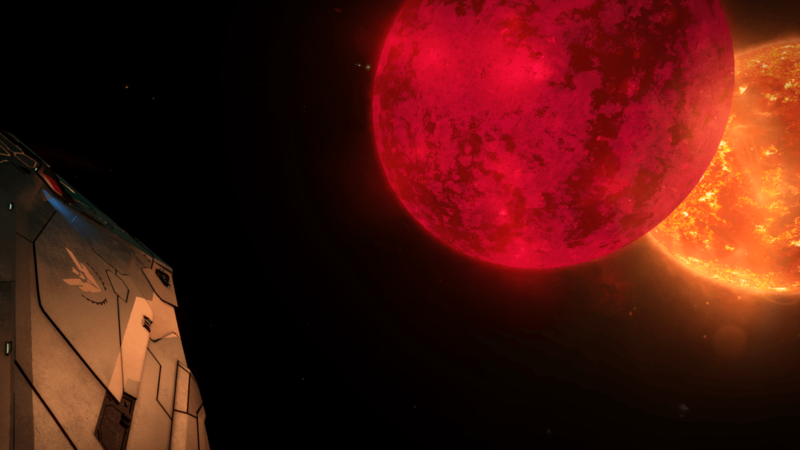 Elite: Dangerous gives you so much more than that. From space couriering, bounty hunting, space pirating or many other limitless missions for 3 different factions, you decide what kind of pilot you want to be. Or if you are simply brave enough, fly through the cosmos discovering planets and landing on their surfaces all in a gritty, realistic space sim. The depth of this game is outstanding. If No Man’s Sky is Mario Kart, then Elite: Dangerous is Forza Motorsport. 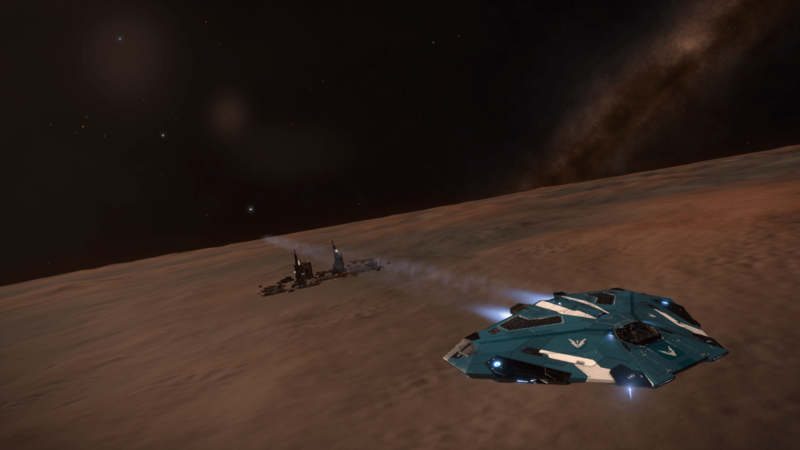 In Elite: Dangerous you are CMDR (insert your name), in a simple ship called a Sidewinder. You find your Sidewinder docked at a space station where you are able to select from different missions to gain faction reputation and credits. You have the option of choosing missions for your local star system or further systems for more credits. I could go on for paragraphs describing how this game works, so just refer to the video below. So here you are jumping from one star system to the next using your faster-than-light Frame Shift Drive engines, docking at other stations, landing on planets, turning in missions, blowing up enemies, delivering or smuggling your cargo for credits. Credits of course can be used to upgrade your ship’s capabilities, buy bigger and better ships, etc. But ask any CMDR out there and they will tell you, “Never fly what you can’t rebuy.” Your base sidewinder may be free, but any upgrade or ship that costs you credits has to be rebought under insurance (10% of the total ship/upgrade cost). No funds for insurance premiums, you lose your top of the line ship forever. After a few weeks and a few dozen game restarts, you get used your quaint free little ship until you have the basics down. Granted that Elite: Dangerous is a space exploration game that takes place 1300 years in the future, it tries to remain scientifically accurate as possible. Planets have different gravitational forces and alter even space flight, let alone landing conditions. Distances are accurate and feel real. Every entity in a star system is at least 100 light seconds apart, others up to 400,000Ls. Star systems themselves are 1-30 light years apart. Depending on your chosen speed in FSD supercruise, reaching one planet could take you 20 seconds or 98 hours. 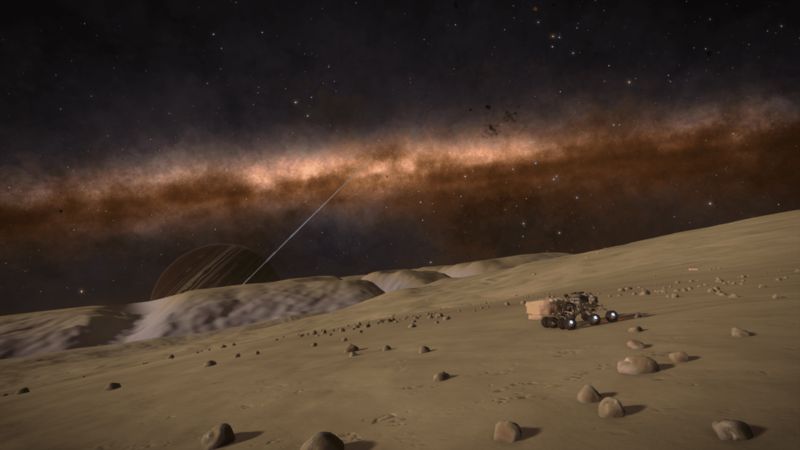 Elite: Dangerous forces you to feel the vast emptiness of space. Travel fast enough and system mapping shows you planet orbits and other info, but if you take a moment to drop out of supercruise and sit in space there is literally nothing around you for years. It’s both awe-inspiring and utterly lonely. Besides the deadliness of space itself, Elite: Dangerous‘ AI will attack you for your cargo or come to your aid and assist you during a fight. Now, luckily I haven’t encountered any hostile fellow CMDRs in this MMO, they tend to stick to their own and run missions. From what I’ve heard however, it’s not a pretty sight when a veteran CMDR wants your blood and they take it with their 75 million credit ship armed with superior fire power. The good news is that Elite: Dangerous lets you team up with wingmen and travel the galaxy together to give you that sense of security. Again like space itself, everything can and will kill you at any given time. 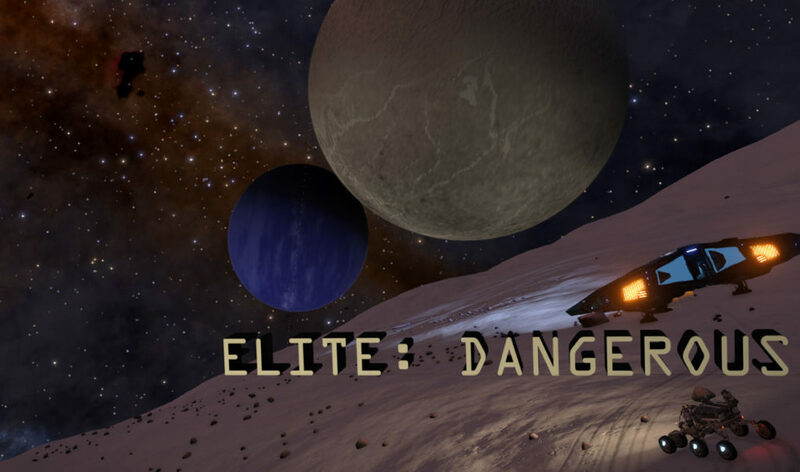 Along with your fellow CMDRs, Elite: Dangerous has a long-standing reputation with die-hard fans who have created amazing groups that you can call upon or even let you join once you’ve proven yourself. Elite Pirates meet and discuss trade routes and tactics, Elite Miners share asteroid locations and refineries, to the Fuel Rats who can come to your rescue when you’ve been ballsy and hyperjumped your poor little ship one star too far and ran out of fuel. And that’s only what I could fit onto this page, barely. But you have to realize that this is an entire ship’s controls, not to mention surface rover controls, docking and computer controls. Every detail is thought out in Elite: Dangerous’ control schemes so when you do have them down, you are a master of space flight. Out the door goes “Press A to take off” or “Press A to land”. Earlier this year, Frontier released Elite: Dangerous Horizons, a season pass for version 2.0 and up, giving players the ability for planetary landings, engineers that are spread across the galaxy that assist in crafting items from mined or found materials. Upcoming updates will give players larger ships that allow for fighter wings or quite the opposite, ferrying passengers across the galaxy. If Elite: Dangerous has any shortcomings it’s the laggy transitions from star system flight to docking, and vice versa but nothing game breaking. PC users having far superior hardware don’t run into this issue luckily. While NMS lets you wander a planet on foot, for now players in Elite: Dangerous are still confined to surface vehicles. Elite: Dangerous‘ soundtrack has 86 different tracks but the only noticeable ones are the same 5-8 repeated during space flight, which ends up being 80% of your time spent in this game. I just end up turning off in-game music and listen to the Interstellar soundtrack or No Man’s Sky soundtrack (good things do come out of bad situations). However, the visuals are stunning, recreating our own known galaxy (and some guessed unknown bits). All of these images shown here are actual in-game screenshots I myself took. Basically this game is phenomenal. I say all of that to only say this: this is merely an incomplete review. From my 50 hours already clocked in on this game I have barely scratched the surface of what is possible in Elite: Dangerous. If future updates continue to promise ever-expanding things to do and see, my “imperfect score” will forever remain. While No Man’s Sky has invoked internet riots and forced digital retailers to refund players for it’s empty promises, I sincerely give it a lot credit. Hello Games, a small indy developer who made arm-chair critics rave then revolt, in essence created what some casual players consider a video game genre no one thought they wanted.